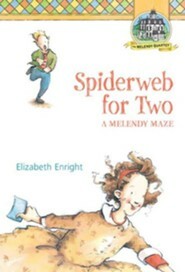 The Four Story Mistake is the second volume in Elizabeth Enright's Melendy Quartet series. Siblings Mona (13 -the aspiring actress), Rush (12 - the aspiring musician), Randy (10-and-a-half - the aspiring artist and dancer), and Oliver (6-who likes playing with army toys) are moving with their father and nanny away from the city and the rooms they've always lived in to a new house out in the country known as the "Four Story Mistake." Written with an eye towards the everyday enchantments of childhood, the children explore their new surroundings, discovering brooks, eccentric neighbors with alligators in the bathtub, a dusty cellar with troves of ancient magazines and toys, and mysteries boarded up behind the walls of their new home. 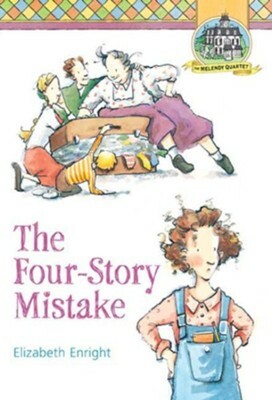 Written over half a century ago, The Melendy Quartet books are simultaneously a winning portrait of the mid-20th century, as well as a timeless tale of childhood fun. 177 pages, softcover. Elizabeth Enright (1909-1968) was born in Oak Park, Illinois, but spent most of her life in or near New York City. Her mother was a magazine illustrator, while her father was a political cartoonist. 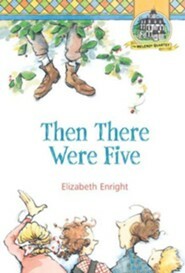 Illustration was Enright's original career choice and she studied art in Greenwich, Connecticut; Paris, France; and the Parson's School of Design in New York City. After creating her first book in 1937, she developed a taste, and quickly demonstrated a talent, for writing. Throughout her life, she won many awards, including the 1939 John Newbery Medal for Thimble Summer and a 1958 Newbery Honor for Gone-Away Lake. 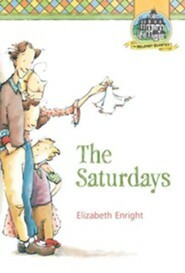 Among her other beloved titles are her books about the Melendy family, starting with The Saturdays, published in 1941. Enright also wrote short stories for adults, and her work was published in The New Yorker, The Ladies Home Journal, Cosmopolitan, The Yale Review, Harper's, and The Saturday Evening Post. She taught creative writing at Barnard College. Translated into many languages throughout the world, Elizabeth Enright's stories are for both the young and the young at heart. The Melendys are the quintessential storybook family...[their] ardent approach to living is eternally relevant. I'm the author/artist and I want to review #2: The Four-Story Mistake.